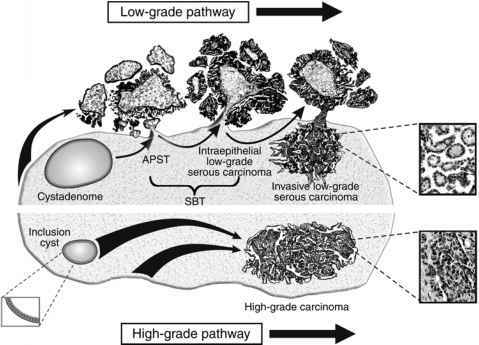 The pathogenesis of ovarian carcinoma, the most lethal gynecological malignancy, is unknown largely because of the lack of a tumor progression model. This chapter reviews a newly proposed pathogenesis model. In this model, surface epithelial tumors are divided into two broad categories designated type I and type II tumors, which correspond to two main pathways of tumorigenesis. Type I tumors tend to be low-grade neoplasms that arise in a stepwise fashion from borderline tumors, whereas type II tumors are high-grade neoplasms for which morphologically recognizable precursor lesions have not been identified, so-called "de novo" development. This model provides a morphological and molecular genetic framework for future studies aimed at elucidating the pathogenesis of ovarian cancer. Unraveling the complex molecular pathways in the development of ovarian carcinomas will not only shed light on the pathogenesis of ovarian cancer, but will also provide the scientific basis for the development of new diagnostic tests and novel target-based therapy for this devastating disease.